Comfortable clothing styles for women, decorative home accents, kitchen and dining essentials and more country home products from the Country Store catalog. Country Store Catalog - A general store - right at your fingertips! Shop with nostalgia as you browse selections that suit your casual lifestyle. Shop the Country Store catalog online to experience a charming collection of comfortable clothing staples, decorative country home products and accents, clever gadgets, appetite-tempting cookbooks for the kitchen shelf and heartwarming seasonal selections. All this and more, under one "roof"! Country Home Products - When it comes to country stores online, the Country Store catalog excels at bringing you decorative home accents and gifts that add a festive touch as well as a dash of down home country charm to any room. From accent rugs and mats to accessories for the bed and bath, you'll find country home products that range from curtains, chairpads and slipcovers to clocks and throws, books and calendars, outdoor and garden essentials and more must-have household helpers. 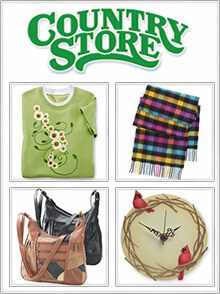 Country Store Apparel - The Country Store catalog features timeless, comfortable and casual styles for women to live in. Fill your wardrobe with easy to wear styles that are just right for your lifestyle from pretty patterned sweatshirts and cozy tees to loungewear and effortless skirt and pant sets available in a wide range of seasonal and nature inspired designs, as well as women's Plus Size and Misses sizes. Kitchen & Dining - Find all of your kitchen and dining necessities in one convenient spot with the Country Store catalog's collection of clever kitchen gadgets and utensils, bakeware, cookware, tasteful cookbooks, cheerful kitchen textiles, small appliances, tabletop decor, kitchen storage tools and more helpful country home products that every hostess and pampered chef needs within their reach. Country Store Christmas - Deck the halls and your closets with a seasonal selection of festive apparel, decor and more delightful country home products that celebrate all of the joys of the Christmas season. Spread holiday cheer with merry tablecloths, winter themed sweaters and nightgowns, hanging mistletoe to gingerbread bakeware and an assortment of other seasonal holiday gifts that will warm the hearth and the heart. The Country Store catalog is your online general store, featuring feel good apparel, seasonal accents, country decor and so much more. Whether you're searching for country home products for your own home or special items to share as gifts, you'll find a country home catalog filled with dozens of heartwarming options that will make any country home complete.